This is more like it. I used 2x2's which are really more line 1 1/2" and these suckers are solid now. If you sort of half-squint your eyes, the shape of a boat sort of springs to mind, doesn't it? That, or a row of tombstones in a very crowded cemetary. 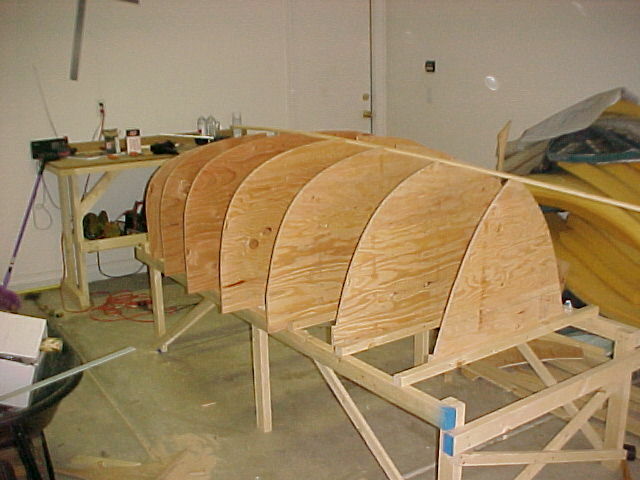 So I've reached my second milestone, the first of which was completing the building frame, and now the possibility to pretend like I was building a boat without spending a whole lot of money comes to an end. 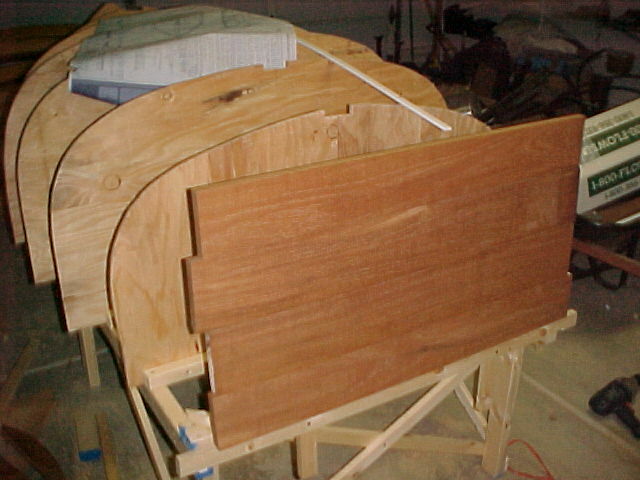 Next steps are the stem, transom and hog, all of which will be done with mahogany, if I can manage to find anybody who sells it. It's been several days since I have had a chance to work on the boat. Part of the time has been spent scouring the city looking for a source for wood meant for things other than slapping some frames up and hammering fiber board to them, but I finally found a place called The Woodworker's Source in Phoenix. The selection is amazing, but you of course have to have a pretty critical eye to make sure you get what you want. 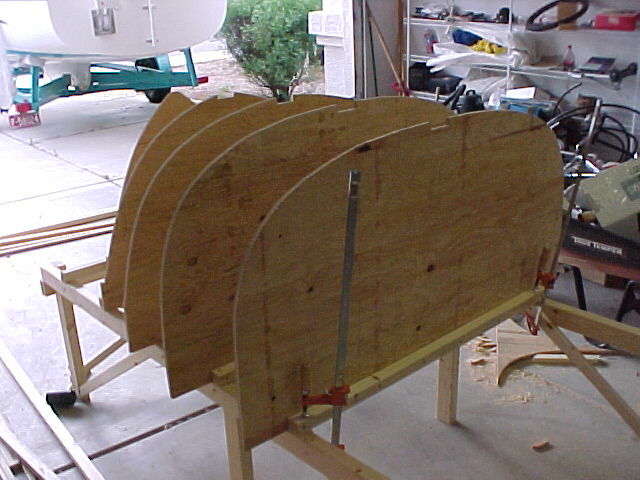 In the mean time, I put together a contraption meant to hold the transom at the 93 degree angle required by the plans, and amazingly enough, these meet those measurements exactly. Once in a very great while I do something right, but generally I have to do just about everything at least twice before I get it the way I want it. I finally picked up what I considered to be pretty decent mahogany and here I'm testing the fit of the boards to one another. The old adage, "measure twice, cut once" is simply not sufficient for me because I measure the cut of these boards several times and it still looks as if I may have cut them too short, or at least they are so close as to leave no room for error. 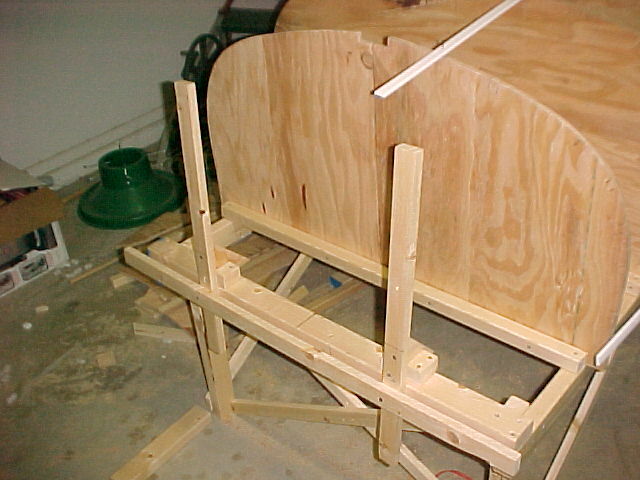 I also started putting the stem together, but I'm too ashamed to show the pictures of the effort. You have two ways to go when putting together the stem; you can laminate several thin strips of wood and epoxy to build up the stem with the proper curve, or you can simply cut and glue pieces together to build it up. I chose the latter method, during the execution of which I botched up several pieces of beautiful mahogany so bady that I wanted to cry. I haven't given up on it, but I'm definitely considering other options.